Although this was our first ever attempt at brewing, we have 2 experts just an email away. My brother, Tony, has been brewing truly world class beer for ages. According to him, I'm trying to brew with stone-knives and bear-skins, but he has lots of helpful advise and he's very patient with my bumbling attempts. His comments on my initial attempts were along the lines of "Jon, since you're its mother, you'll probably like the beer, but others might not be so enthusiastic." Hmmm... OK. Kim, of Vamp fame, now lives just an hour inland of Brisbane. He also brews a lot of beer (which I quite like) and he's familiar with the Australian kits. Kim suggested that he's always had good luck with the Coopers products. This was my first ever attempt at brewing, and I made several mistakes. I didn't realize I'd need stirring spoons, so I didn't bring any for cleaning. I could have used more sugar in the primary fermentation - priming doesn't need much. The hot water I used for dissolving the sugars and malt extract was just hot tap-water. This can have strange dissolved minerals that can affect the taste of the beer (which I should have realized from my British Tea-making heritage). I used too much hot water initially and then couldn't get the temperature cool enough for ideal fermentation. My 'thermometer' is just a liquid-crystal strip stuck on the side of the carboy. It's not accurate enough and it seems to read too high. We left Ocelot 1 day to visit my uncle. The day was hot and the beer got too warm, possibly killing some yeast. I used "Brewing Sugar", a mix of sucrose and maltodextrin, for priming. The non-fermentable maltodextrin meant that the bottles didn't prime properly, resulting in a lack of carbonation. But, of course, I didn't know about these mistakes at the time so I went ashore with a happy heart and high expectations. Took the carboy, water-trap, Coopers Brewing Sugar (Sucrose/Maltodextrin mix), the Real Ale kit with its yeast and instructions, a scrubbing pad, and the 2 cleaning solutions. Cleaned the carboy (which may never have been used before) with both detergent and sodium metabisulfite but forgot to do the threads of the spigot. Cleaned and sterilized everything else and prepared to start the primary fermentation. Put a couple of liters of hot tap water in the bottom of the carboy over the sugar. The instructions say up to 4 liters are OK, but they probably assume it can be cooled easily. Opened the can of Real Ale mix with my handy Swiss Army Knife and poured the dark brown soupy mix in as well. Held the can over the carboy for a minute as it dripped and then put some hot water into the can and swirled it around to get the mix off the walls. Poured that into the carboy as well. Realized at this point that not bringing a stirring spoon was a tactical blunder, so I tried swirling the wort to get it to mix. This probably worked OK but a large slotted spoon would have been much better. Added more cold water (about 5 liters at a time) and continued to swirl the wort, but the temperature didn't seem to be dropping very quickly. Eventually decided that something radical had to be done, so I carted everything back to Ocelot and added all the ice-cubes that we had (about 20 small ones) and all the refrigerated water (about 2 liters). This got the temperature sensitive strip on the side of the carboy to report a temperature of 32°C (90°F) which is far from ideal but is the extreme high end of OK for the yeast. All the swirling had created a fair amount of foam on top of the wort, so I cleaned a big spoon as best I could (but not really good enough) and used it to scoop the foam off. My instructions said that the wort is quite vulnerable at this point, and that the yeast should be added if the temperature is between 64°-90°F (18°-32°C) so I sprinkled the yeast on top of the wort and closed the lid firmly. I put a bit of water in the trap and inserted it in the hole on the top of the carboy. I set the carboy in the shade of the cockpit, in the breeze, and hoped. It was about 8pm, but I forgot to take an initial specific gravity reading, so I'll be unable to determine the alcohol content of this batch. The day looked like it was going to be a scorcher, but we were scheduled to visit my uncle Shaughn and Aunt Dot on the Gold Coast, about an hour south of Brisbane. 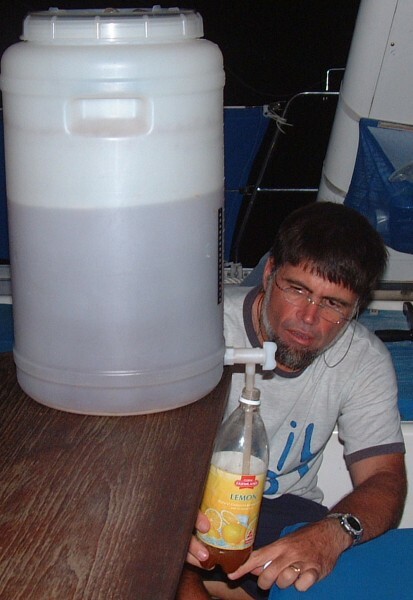 I wrapped the carboy in wet towels and put it just outside the companionway. It would be shaded and out of the worst of the heat, but might still get a bit of breeze. When we returned that evening I again tried to cool the carboy down by wrapping it in wet towels. I was very afraid that the intense heat would kill the yeast. Panic time - I was pretty sure the high temperatures had killed the yeast. This would mean that the wort was in an indeterminate state (fermentation may not have completed) and that priming probably wouldn't proceed at all. I didn't yet know that my "thermometer" tended to read much too high. So I sent an email off to Tony and Kim, asking for advise. Tony responded right away with some excellent advise. He assured me that fermentation could complete in only 30 hours in our high temperatures, and that the yeast could easily stop producing CO2 but still be alive. He suggested that I take the specific gravity and taste the beer. If the SG was at or below 1.010, and the beer didn't taste funky (just flat) then I should proceed to bottling. The SG was just at 1.010 and the beer tasted flat but just fine. Yes! Tony also mentioned that the wort could be left in the carboy for a few days after the reaction had stopped without hurting the beer. Woo-Hoo! Spent several hours this afternoon cleaning bottles. Luckily, they were already very clean, but some had been sitting for some time with a bit of water in them, so I cleaned everything again. We had been collecting plastic bottles for several weeks and had bottles in 600ml, 1-, 1.25-, and 1.5-liter sizes. I decided to standardize on the 1.25 liter size, so I took all 16 of them (enough for 20 liters) and 4 of the 600ml bottles just in case something went wrong with a big bottle. Here in Brisbane they allow us to use a laundry room with a big, stainless-steel sink and unlimited hot and cold (well, cool) water. I took everything there and washed it all thoroughly. We bottled on Ocelot as I didn't want to move the carboy and disturb the yeast that had settled on the bottom. rocks the bottles gently to dissolve the sugar. My bottom-fill tube has a valve in the bottom of it that is supposed to open when you push it on the bottom of the bottle. This would fill the bottle from the bottom, minimizing the amount of foam that forms as the bottles fill. The problem was that the little probe that opened the valve broke off. I took a steel pin, heated it over the stove, and plunged it into the plastic valve, where it buried itself encouragingly. Unfortunately, it broke off again on the first bottle. I recovered the pin (now slightly shorter), washed out the bottle, re-heated the pin and again stuck it in the valve. This lasted for the entire bottling operation, but broke again when I cleaned everything up. Clearly, this is a weak point in my equipment that I need to replace. Our sugar measuring scoop has cups for charging 330ml, 500ml, and 750ml bottles, so Amanda used 1 750ml scoop and 1 500ml scoop to charge our 1250ml bottles. Amanda filled all 16 bottles quickly, and then set about pulling the labels off those that she could, as well as gently rocking those bottles that I'd filled to dissolve the sugars. I was fully occupied with filling the bottles as full as possible while preserving the delicate valve at the bottom of the fill tube. The operation seemed to go very well and only took an hour or so. We also bottled a bit of the bottom sludge in 3 of the 600ml bottles, but they were rather yellow and we expect them to taste rather yeasty. The other bottles have a nice, rich, golden color that we hope indicates good body. By the time the last bottles were finished, the first bottles were already showing signs of carbonation. They were obviously pressurizing! We stored them down in the bilge for now. A bit disappointing actually. The flavor was rich, but a bit too "hoppy" for my taste. Not sure if this is a trait of the "Real Ale" mix or because of some blunder of mine. Hopefully, the latter, as I'd like to try the Real Ale again. Still, it wasn't a bad taste, just not ideal for my palate. We primed with our brewing sugar, a mix of sucrose and maltodextrin. The maltodextrin doesn't ferment, so the yeast can't use it to produce carbon dioxide. Use the checklist to make sure everything I'll need is clean and sterile. Don't use hot tap-water (may not need hot water at all) for the wort. Use more (and better) sugar in primary fermentation. Monitor the temperature better (pick a cooler period if possible). Replace the valve at the bottom of my fill-tube. Try to avoid sucrose during initial fermentation (see sugar discussion). Use dextrose for priming, not maltodextrin.